It is Liverpool FC International Academy America’s desire to make the online tournament check in as easy as possible. It is our priority to maintain an integrity of the age divisions to provide a fair experience for all players. Our tournament series is sanctioned through the North Texas Soccer Association although we do accept teams sanctioned through North Texas Soccer Association, US Club, USYSA. Travel permits for out of state teams will are required. Our goal is for every player to play, and we will work with you to achieve that whenever possible. For your convenience all check in is completed online. Check-In deadline is 12 noon on the Wednesday prior to the tournament. Go to www.gotsoccer.com and login into your team account. Select the tournament you have registered for. Across the top of the screen select the documents tab. In the tournament document upload box, use the drop down arrow to select the name of the document you are uploading. 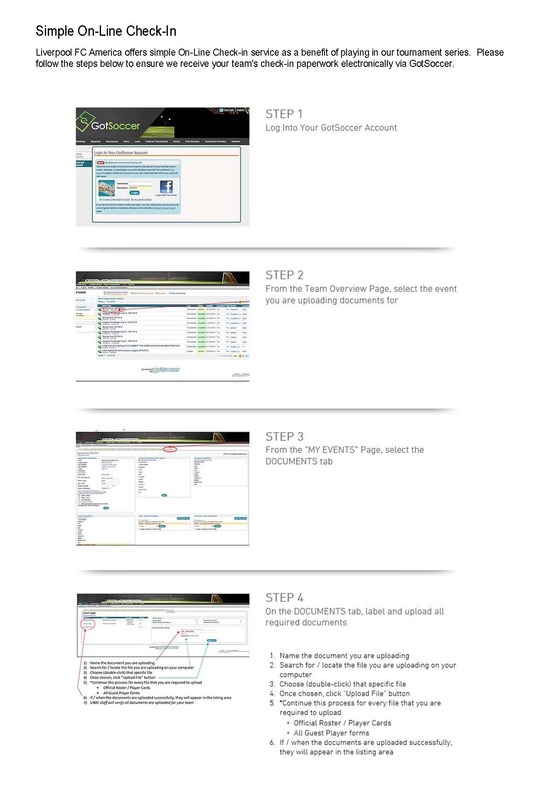 Browse for your document, click on upload. You will need to upload copies of your sanctioned roster and any guest player documents. Travel Permit if required. ALL SUBMITTED DOCUMENTS MUST BE IN PDF FORMAT. GOTSOCCER – Every player, including guest players, must be entered into your team GotSoccer roster for this event.Photos must be included.Referees may use the GotSoccer App to verify each player prior to each game.Only photographed players listed in GotSoccer will be considered eligible to play.For instructions on downloading the GotSoccer app please visit our tournament website under GOTSOCCER help. a. USYSA State Association signed roster (NTSSA, OSA, STYSA, etc…) All players must be included, and roster must be signed. b. US Club Soccer Official Roster.Each player must have a Card Valid date.If NO CARD is listed for a player then that player has not completed their US Club registration, and they are not eligible to play.If a player is registered on another US Club Soccer Official Roster, then we will need a completed US Club Soccer Player Loan Form for that player. Referees will have score cards for all games.At the end of the game the referees give the score card to the winning team (Home team in case of a tie) to be turned in at the tournament headquarters tent immediately after the game.To ensure your score is accurately reported make sure ALL information on the card is accurate.